Catering Management Guide from C.H.I.P.S. 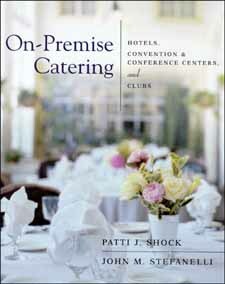 On-Premise Catering is the definitive guide to catering in hotels, banquet halls, wedding facilities, conference centers, private clubs, and other venues. This new Second edition has been thoroughly updated and revised to cover modern technological trends in the industry, including online marketing, social media, and digital proposals, as well as modern décor, effective menu writing, catering in stadiums and casinos, and more.